Kimberly brings over 13 years of public accounting experience to The Block Teitelman Group, assisting in all practice areas and on all clients served. 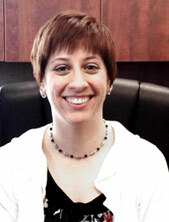 She specializes in partnership, corporate and individual tax returns. Her responsibilities include conducting audits, reviews and complications of client's records, preparation of business and individual tax returns, and working with clients to maintain accurate business accounting records. Kimberly received her Bachelor of Arts degree in Financial Accounting from Lycoming College. She is a member of the American Institute of Certified Public Accountants (AICPA) and the PA Institute of Certified Public Accountants (PICPA). Prior to joining The Block Teitelman Group, Kimberly obtained the majority of her public accounting experience locally at William L. McKeman, CPA, PC. Kimberly and her family currently reside in Downingtown, PA.